The Virtual Potluck group is teaming up with Bob's Red Mill (BRM) and California Olive Ranch (COR) during the month of January to demonstrate how easy it is to incorporate olive oil and whole grains into your meals making every course a healthier one. Both BRM & COR seem to be great companies passionate about their products and where they originate from. You can read more about them here and here. Our first challenge is to create an appetizer featuring BRM Hard White Whole Wheat Flour and COR Arbequina extra virgin olive oil. 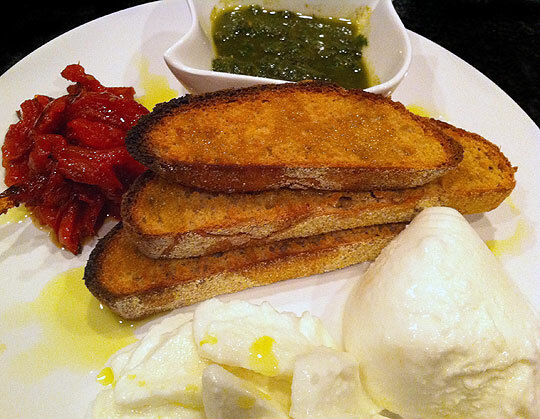 I love bruschetta type appetizers....fresh grilled bread topped with varying flavors...you can't go wrong. So I adapted my standard bread recipe to incorporate the BRM Whole Wheat Flour and came up with a delicious tasting "good for me" bread. I topped it with pesto that I made using the fresh fruity flavored Arbequina oil, some oven roasted tomatoes and fresh Buffalo mozzarella. The result was amazing. For an extra entry you can follow VP on twitter and tweet about this contest using the #virtualpotluck hashtag and leave a comment here letting me know. You can get additional entries by visiting our host blog for this event and look for the list of participating bloggers; leaving comments on their pages will get you an entry. Preheat oven to 350 along with your baking stone if using, and pour 1-2C water into a metal pan at the bottom of the oven. Bake 40 mins. Mix everything in a food processor until desired consistency. Preheat the oven to 200°F. In a large bowl, toss the tomatoes with 1/2 cup of COR and salt and pepper to taste. Sprinkle with sugar. Place cut side down on a small baking sheet and bake for about 2 hours, or until the tomatoes are softened. Grill slices of bread drizzle with some COR oil. 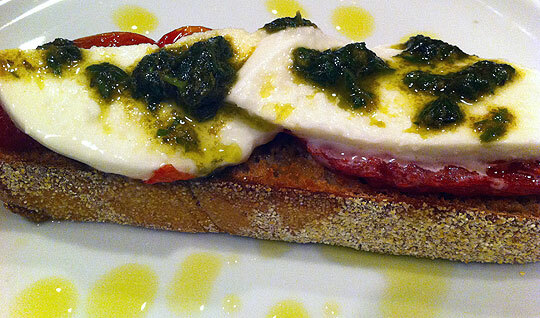 Top with oven roasted tomatoes, buffalo mozzarella and drizzle with pesto. I love Bob's Red Mill. Beautiful and simple dish here! Love bruschetta and yours looks amazing! I've been dying for a really GOOD whole wheat bread recipe and am thrilled to find one that will allow me to use this bottle of ARBEQUINA I just received today. This post just makes me what to throw some flour around and bake bread....or make mozzarella! Gorgeous! This looks great! I read that arbequina is great for pestos. I'm really excited to try the arbequina olive oil in the pesto sauce. Seriously, you just can't go wrong with bruschetta...or with seriously large slices of cheese! Great dish. I would love to try arbequina olive oil on some fresh bread! Pesto w/Arbequina olive oil sounds like a great combination. This pesto dish with COR ARBEQUINA and BRM products looks delish -- congrats! I would love to try some arebequina olive oil! Thank you for sharing yet another delectable post. I'm exhausted after my first day back from vacation, but happy to be reading your words and seeing your eats! I hope you are doing well, my friend. It would be interesting to see how pesto made with Arbequina olive oil might taste slightly different than with other olive oils I've tried. oh boy, love a good olive oil, and this is certainly a delightful way to highlight it!! You've inspired me to pick up some fresh basil tomorrow for pesto. Hopefully, the market carries Arbequina Olive Oil. I like how it has a substantial golden hue, and would love to try a new oil. There is nothing as wonderful as home made bread! Arbequina trees are quite beautiful and produce some amazing olives. A terrific and delicious post!! Where can I buy COR Arbequina in Miami FL? ?